It's early days yet on Game Of Thrones season 7 and it's already getting all too much - very, very too much indeed. Twitter is bursting with all sorts of feels, because a) Jon Snow b) Tyrion Lannister and c and most importantly) Olenna, Queen of Thorns, who went out with a bang in an episode titled The Queen's Justice. 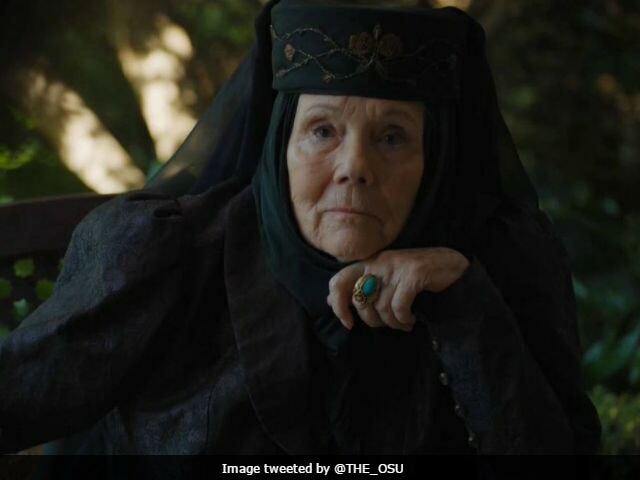 Olenna Tyrell, astute of mind and acid of tongue and played by Diana Rigg, grande dame of the British stage and screen (she played Mrs James Bond, did you know? ), was a favourite with Game Of Thrones fans. And what a way to go - not since Jon Snow's unexpected and shattering death a few seasons ago has an exit scene caused this many headlines, memes and whatnot. Olenna Tyrell, given poison to drink by Jaime Lannister, delivered a body blow in between the drinking and the dying - it was she who engineered the murder of King Joffrey, son of Jaime and his sister Cersei. Tell Cersei, Olenna Tyrell urged Jaime before she died. That's some insane swag. In between deep breaths, Twitter gave Olenna Tyrell a grand send-off - even getting in a joke at the expense of Anthony Scaramucci who has been fired as Donald Trump's media chief 10 days into the job. Lady Olenna: "Oh btw, I killed your evil son. Tell Cersei." House Tyrell is now one short (in fact, House Tyrell all but dies with Olenna) but another fan favourite returned to reclaim his honours. Tyrion Lannister, with a tongue almost as wicked as Olenna's, has an eye on Casterly Rock and the legacy of his father Tywin. And, of course, there's Jon Snow, who knows something now and has the formidable Daenerys, Mother of Dragons, to impress.